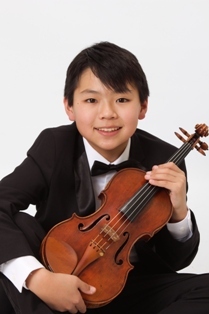 Winner of the Junior 2nd Prize, Junior Audience Prize and the Jonathan Moulds Award for Outstanding Potential in the 2016 Menuhin Competition London, Kevin Miura already enjoys a busy performance schedule and is becoming recognized as a dynamic young artist. He has appeared as a soloist with several orchestras across his native Southern California and in 2011, Kevin was invited to perform in Weill Recital Hall at Carnegie Hall. Most recently, he was a featured performer on NPR’s radio broadcast From the Top and subsequently participated in a music video with Time for Three. Kevin is a student of Danielle Belen at the Colburn School in Los Angeles and during recent summers he has studied at both Center Stage Strings and the Ishikawa Music Academy in Japan. He will attend Perlman Music Program this coming summer. Kevin plays on a Joseph Rocca violin on generous loan from The Mandell Collection of Southern California. You can watch Kevin performing for the Menuhin Competition Junior First Round, Semi-Final, and Final. And you can also watch Kevin playing with From the Top and Time for Three’s violin cover of Taylor Swift’s 2014 song “Shake It Off”. If you are interested in working with Kevin, please get in touch with the EMCY Office.